This guide is to give you an overview of resources available through the Drain-Jordan Library, similar to what students will learn in our Library Introduction classes. I need sources for a paper, where do I start? What's the Difference Between a Scholarly and Non-Scholarly Article or Resource? In academic research it is important to distinguish between scholarly (academic or expert) and non-scholarly (or popular) sources. While both types of sources are valuable in research, most academic work will favor scholarly sources over non-scholarly ones. Below you'll find a brief comparison of the two, and when to use each in your research. A scholarly publication is one in which the content is written by experts in a particular field of study - generally for the purpose of sharing original research or analyzing others' findings. Scholarly work will thoroughly cite all source materials used and is usually subject to "peer review" prior to publication. This means that independent experts in the field review, or "referee" the publication to check the accuracy and validity of its claims. The primary audience for this sort of work is fellow experts and students studying the field. As a result the content is typically much more accurate and advanced than articles found in general magazines, or professional/trade journals. A good example of the typical components of a scholarly journal article can be found in the Anatomy of a Scholarly Article from North Carolina State University Libraries. While many of your research projects will require you to read articles published in scholarly journals, books, or other peer reviewed sources of information, there is also a wealth of information to be found in more popular publications. These aim to inform a wide array of readers about issues of public interest and are more informal in tone and scope. Examples include general news, business, and entertainment publications such as Time Magazine, Business Weekly, and Vanity Fair. This can also include .edu and .gov sources you've found on the Internet, that have not been verified as a scholarly source. Note* Special interest publications which are not specifically written for an academic audience are also considered "popular" i.e., National Geographic, Scientific American, and Psychology Today. I've found a journal I like, but how do I know if it's scholarly or not? Another way to find articles that are scholarly is to check the Peer Reviewed option box that appears in many of our databases. 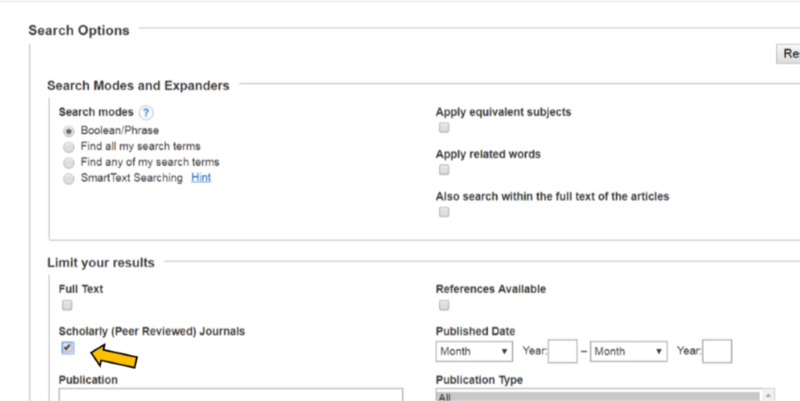 This way, when you search, it will only pull up journals and articles that have been peer reviewed. Below is an image of where this box is within our EBSCO databases, but it also appears in many others, such as Academic OneFile, all the Gale databases, and all the ProQuest databases. If you are not finding your source on Ulrich's, and it doesn't meet the requirements for scholarly sources listed above, then err on the side of caution and assume it is not scholarly. Most sources, if they are from our databases, will say what journal they're from and whether or not they have been peer reviewed. As always, if you need help at any point finding good peer reviewed sources, please don't hesitate to Ask Us!